Restaurant Review & Giveaway: Noodles & Co - 2 New Salads! | The Food Hussy! Restaurant Review & Giveaway: Noodles & Co - 2 New Salads! I love Noodles & Company - it's a quick service lunch with pasta - 'nuff said. It's also close to my work - so that's more bonus points...AND they have a Coke Freestyle. 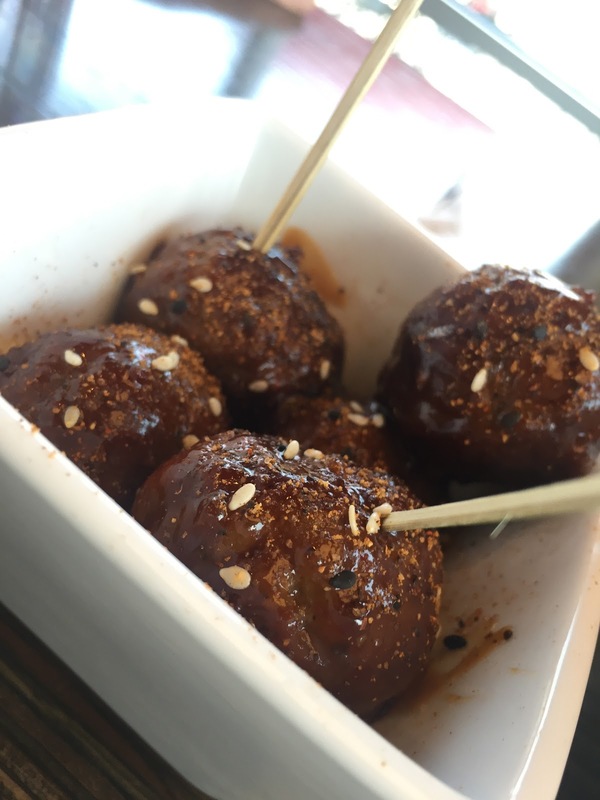 Before the salads though, the manager said I had to try their Korean BBQ Meatballs. The thing is - I've tried them before - but I like them - so SURE I'll try them again! They're made with the "new" Sriracha which is Gochujang. Yeah, Sriracha is so 2015! The little flecks of seasoning will kick you in the hiney!!! So watch out if you don't like spice! Here are the details on the $10,000 World Tour - you get one of these salads and a drink and then selfie it up - share it and you're entered! Super simple! So what's the deal with the World Tour? Well - Noodles prides themselves on offering dishes from all over the world - so whether you like Indian, Thai, Italian, American or a variety of others - you can find a pasta or salad that fits the bill! So they want to send you on a World Tour as well! But now - the salads! First - the Chicken Veracruz Salad - it's loaded!! 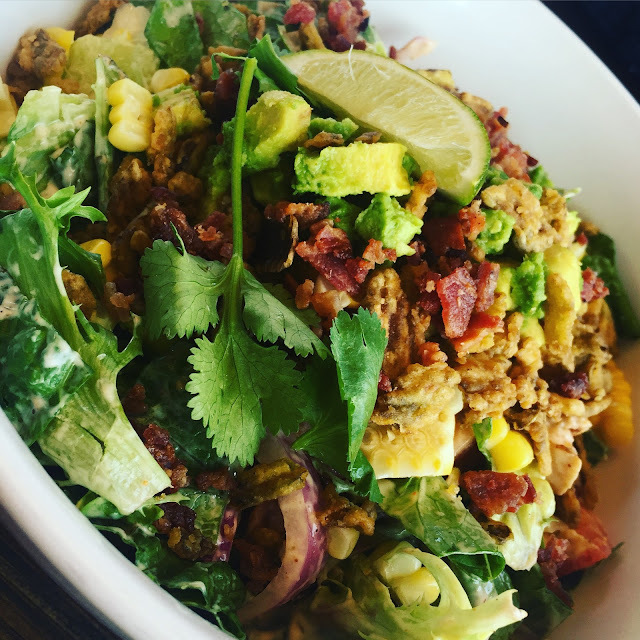 Mixed greens, roma tomatoes, red onion, chili-lime chicken, crumbled bacon, fresh cut corn, crispy jalapeños, avocados and cilantro tossed with Jalapeno Ranch dressing. It's got a kick - especially with the jalapenos. My buddy and I shared the salad and he really liked this one - but I was able to get half of it. :-) I liked it too - it was crispy and refreshing and spicy all at the same time. Like a taco salad but better! And it's only 510 calories!!!! 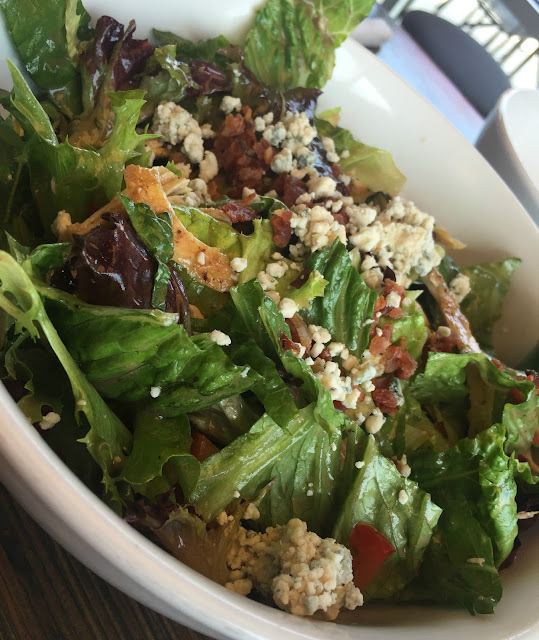 Next up was the Napa Market Salad with Chicken - mixed greens, gala apple slices, roma tomatoes, red bell pepper, pulled chicken, bleu cheese and bacon crumbles tossed with pomegranate vinaigrette. Nate knew he wasn't going to dig on this - something about bleu cheese so it was pretty much all mine - which I didn't realize or I wouldn't have made sure to get my half on the Veracruz! I used to not like bleu cheese - and I still have a level where it gets too stinky and funky - but I now APPRECIATE it. It's got a good kind of funk now - at least the mellow stuff does. I liked this salad and think the apples and the bleu were a fantastic combo! So there you have it - two new salads that could win you $10,000 to travel the world. And I have something else for you! A contest to win a $20 gift card so you can try them on me! Tell me which one you want to try and you'll be entered to win! Thanks to Noodles & Co for the free lunch and the giveaway for you guys! Enjoy!